The next afternoon, I stuffed in my backpack and swept out my tent. Then I meditated in the room where Raghvendra had initiated me a week earlier. Forty-five minutes later, refreshed, at peace and looking forward to going home, I found Raghvendra in the garden and thanked him for his kindness. “Shukrya,” I said in Hindi. “I hope we can meet again.” “God willing,” he answered. I went in search of John, Paul, and George and found them with Cynthia, Jane, and Pattie, sitting at our familiar spot overlooking the river where I’d first met all of them. We all said very warm good-byes. As I turned to leave, John called out, “Hey Paul! Will you send us some of your photos?” Jane volunteered her number in London and said she would pass them along, adding that if I called Apple I’d never get through to them. Mal, Maureen, Ringo, Gypsy Dave, Yvonne and I gathered to load our gear into the taxis that Mal had arranged. Maureen said she was missing her children. Ringo teased her about how she hated the bugs and Mal teased Ringo about the food. And we had a good laugh. Then we began the six-hour drive south and west to New Delhi. Our tiny convoy dropped down from the heavily wooded foothills of the Himalayas, through towns with wonderful names like Muzaffarnagar and Modinagar, and out onto the plains leading to New Delhi. After a couple of hours driving through lush fields worked by turbaned farmers with hand hoes, we pulled into a gas station to fill up. We piled out of the cars and bought soft drinks, chocolate bars and potato chips from an old Sikh man with a wonderful long gray beard and a bright cherry-red turban tied loosely around his head, country style. He stood in his small, solitary stall by the side of the road while above his head a rough-hewn, canary-yellow, hand-painted signboard proclaimed ‘Fanta!’ in large orange letters. Mal handed a bottle through the car window to Maureen and joined Ringo and me on a bench. We talked awhile, finishing our sodas. The sun was setting, a large, orange ball on the horizon, its rays catching tiny ice crystals in the high, wispy cirrocumulus clouds, lighting up the sky in a soft periwinkle blue. Exchanging more warm goodbyes, I shook hands with Ringo and Mal, then said good-bye to Maureen. Hours later, we entered the city. As the route to their hotel veered away from ours, they beeped their horn and we beeped back to say a final good-bye. Some months later, I passed through London and called Jane Asher. We met for a half-hour in a cozy teashop in Kensington and reminisced. I gave her a set of four large poster prints, one for each of the Beatles. “I’ll pass them on,” she said, as we shook hands on Kensington Road. As Jane headed off, I hailed a taxi and headed for Soho. Bob Baylis, an old acquaintance from the National Film Board in Montreal, had invited me to see a new Beatles film, but he wouldn’t tell me what it was. I arrived at George Martin’s Look-Listen Productions. Bob led the way into a small screening room and introduced me to picture editor Pete Hearn and animator Peter Sander. As the four of us settled into large, black leather swivel chairs there was a feeling of excitement at the very first screening of the first “fully timed answer print” to come out of the film lab only one hour earlier. As the opening music of Yellow Submarine started, someone lit up a joint and we slowly passed it around. By the end of the film, we were all joyfully singing the last song, All Together Now, along with the Beatles, with great gusto. 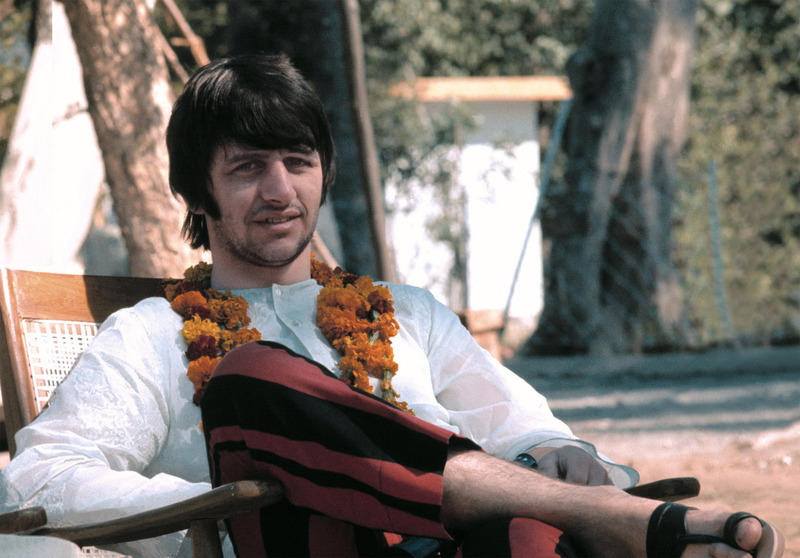 Rishikesh was the last trip the Beatles took together. On November 22, 1968, less than eight months after returning to England, the spectacular White Album came out. They did two more albums together, Abbey Road and Let it Be. On January 30, 1969, they did their final live performance together as the Beatles, for the film Let It Be, an impromptu mini-concert performed on the roof of their Apple office building in Soho, to the surprise and delight of passing pedestrians. It was less than a year since they had returned from India. Finally, on April 10, 1970, Paul announced that the Beatles had disbanded.